For the first time, an American automaker plans to sell a hybrid car for the same, lower price as its gas-powered counterpart, removing at least one obstacle for drivers who want a greener ride. At a little more than $35,000, the 2011 Lincoln MKZ sedan won't be cheap, but the decision by Ford to match the prices of the two styles could lead competitors to follow suit with future models. The hybrid MKZ, debuting this fall and running on both gas and electric power, will be a bargain after factoring in savings at the pump. It gets more than double the mileage of the traditional version in city driving. While automakers won't reveal what they spend to install a hybrid system in a car, the final product usually costs several thousand dollars more than a gas-powered version of the same car. The Lexus HS 250h, the MKZ's closest competitor, costs about $2,500 more than the Lexus IS, a similar, small, gas-powered sedan. Ford charges $8,840 more for the hybrid version of its Ford Escape SUV. The MKZ can still make money even if Lincoln doesn't charge more for the hybrid, said Erich Merkle, president of the consulting company Autoconomy.com. Luxury cars are sold at a significant premium, he said, ensuring a profit for Ford. Lincoln can also borrow the hybrid system from the Ford Fusion, its corporate twin, and save on development costs. "Conventional wisdom is that the hybrid should be priced higher, but there's not really anything to say that a hybrid has to command a higher price," Merkle said. Besides, Ford had to keep the price down, said Jessica Caldwell, an analyst for Edmunds.com. If it had sold for more than $40,000, it would have faced tougher competition from luxury cars like the Mercedes E-Class or the Audi A6, she said. "It's going to take moves like this one to break into the luxury market," she said. Other automakers may not try to match Lincoln's move if it is limited to the MKZ, but they will have to take notice if Lincoln uses the same strategy with future hybrid models, said Aaron Bragman, an analyst with IHS Automotive. John Felice, Lincoln's marketing manager, said pricing strategy is an opportunity to get buyers interested in the Lincoln brand. Even after a complete revamp of its cars in the past few years, Lincoln still lags behind other luxury brands. Lincoln sales were up 7.5 percent in the first six months of this year, compared with 17 percent industrywide. Lincoln is also trying to make up for the sales it is losing by phasing out its Mercury brand, which includes two hybrids. The MKZ is one of most popular Lincoln models, but its sales have fallen 5 percent so far this year. The MKZ will get 41 mpg in the city and 36 on the highway. That beats the Lexus HS 250h, which gets 35 mpg in the city and 34 on the highway. The gasoline version of the Lincoln MKZ gets 18 mpg in the city and 27 on the highway. The new hybrid system isn't the Lincoln MKZ's only nod to the environment. Its wood trim comes from well-managed forests, while the leather seats use a chromium-free tanning process that makes them easier to recycle, Ford said. Lincoln MKZ buyers are not eligible for federal tax credits for alternative-fuel vehicles. Federal law limits the credits to the first 60,000 buyers of a company's hybrids, and Ford hit that number on March 31. Ford is the first U.S. automaker to offer a hybrid and conventional version of a car at the same price. Industry analysts say they are unaware of a foreign automaker doing it, either. 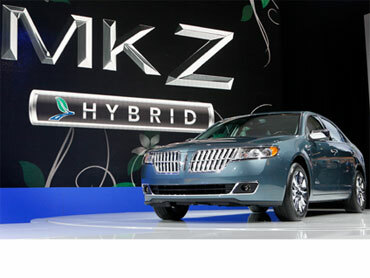 Even if Ford were to lose money on the MKZ hybrid, it would probably be willing to make the trade in exchange for marketing value for the Lincoln brand, said Bruze Belzowski, assistant research scientist at the University of Michigan Transportation Research Institute.